BofA as well as other dealers conduct periodic surveys of their clients' views on various markets going forward. 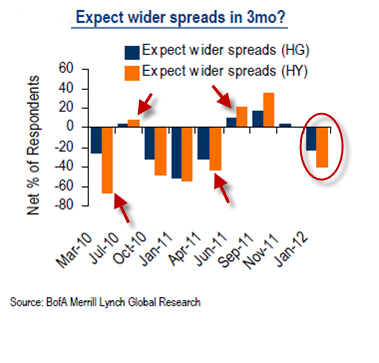 The chart below shows one of those surveys that asks where clients see credit spreads three months out. More specifically it shows the net percentage of participants who believe that spreads will widen in three months. Four out of seven times (red arrows) the survey forecast was wrong . The last forecast predicts that spreads in April will be tighter than they are now. Using this survey as a contrarian indicator, one may want to prepare for wider spreads later this spring.